I absolutely love it! It looks even more gorgeous in person than I could have imagined. I am very pleased! This magnificent bridal ring set from the Miadora Collection features and engagement ring with an oval-cut cubic zirconia center stone surrounded by a halo of round cubic zirconia stones and additional stones along the infinity band. This stunning wedding ring is complemented by a beautiful contour stackable wedding band. Both wedding rings are finely crafted of sterling silver. This bridal set offers an opulent charm tempered by divine elegance. The ring is designed with a lovely crossover band and has received a high polish finish. All carat weights and measurements are approximate and may vary slightly from the listed dimensions. Treatment code CR (Cubic Zirconia). See Treatment Guide for further information. I love this set! When I go in vacation, I bring this set instead of my real set. I always get lots of compliments. The band on the wedding ring is dainty and beautiful and the stone in the engagement ring isn't overwhelming of fake looking. Really nice to find something that doesn't shout CUBIC ZIRCONIA. Would absolutely purchase again. Can't beat the price!! This is a pretty ring set that I use instead of my regular ring set for travel. I think it has a cubic zirconia look to it, but it’s still nice. Gorgeous delicate ring. Looks very authentic and has great detail and sparkle. I think this was a great purchase. This wedding set is so beautiful. Every body that see it thinks cost thousand! My fiance and I have been engaged for the last few months. When we decided to take this next step in our relationship, he said he wanted to take me ring shopping so I could pick out a ring I would be happy with. We went all over and finally, I decided to surf the internet. He kept asking me "what kind of ring would you like?"... Well, this ring is exactly it! It's gorgeous without being too flashy which is perfect. I've always been a fan of halo, oval and shank styles so I was thrilled to find all three in one ring, especially one with a wedding band to match! We even ordered a second so I can use the wedding band on both sides. DF doesn't know anything about jewelry and even he thinks it's beautiful which makes me happy! I just wanted something delicate but with a pop bc my real wedding set doesn't fit. Plus this is fancier than my real set. Something I could wear to look nice and if something happened, it wasn't worth a small fortune. I have gotten so many compliments! 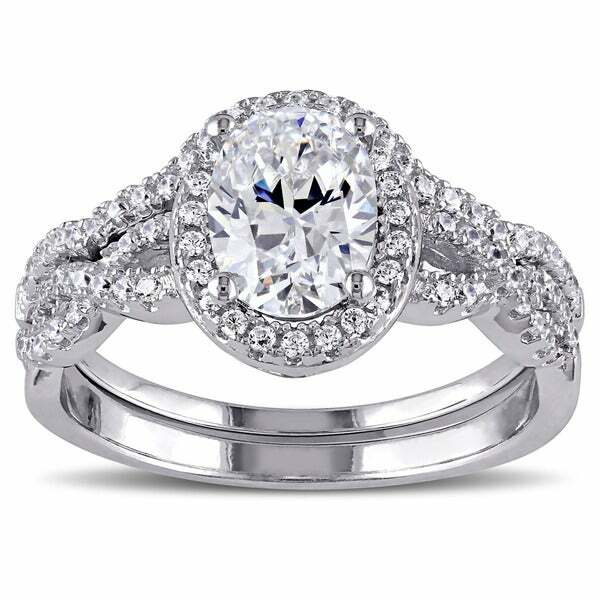 I don't know that the center stone sparkles like a real diamond but it certainly passes the casual glance. Definitely worth the cost! Highly recommend. This is a gorgeous ring. I wore it while my bridal set was in the shop and got so many compliments! My sister saw it at our family Christmas dinner and immediately wanted to know where I got it! I am going to wear it when we go on vacation in a few months instead of wearing my "real" set. The case includes a polishing cloth that really makes the ring sparkle. I did have a little trouble keeping the two rings together on my finger-probably my fault because I ordered it too big. I just put a bit of clear tape on the back of the rings and that solved the problem. I would definitely order this again! I adore this ringset. It fits perfectly and is one of the most delicate and beautiful rings I've ever seen. I receive many compliments. I'd never purchased a cz before this one and it definitely was worth it. I've actually tried to find similar rings in moissonite and I couldn't, so the style for the price is definitely worth it. Thank you Overstock! This set was actually delivered a few hours ago and I couldn't wait to open it. OMG, would have been GORGEOUS. Sad to say the color of the stone was a bit off though, no matter what type of light I put it in...day light, direct sunlight, room light, warm light and low light. It has a purplish tint to it, even at different photo angles...it's nothing like the clarity/pictures that was described or look of the photos that others reviewed this set posted. It was also a bit too big so I had to order a smaller size. I called customer service and the lady was AWESOME in helping assist with another. She said i may have received a defective. ***update***I've received the smaller size. 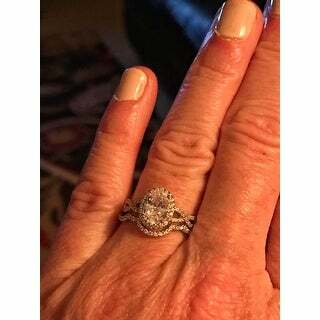 The ring is beautiful and looks like a better quality one, so no complaints. These rings sparkle galore. I've gotten a lot of compliments and wear it almost all the time. ....I have had this since September 2016 and it's turning my finger green. Of course I do wear it all the time and wash my hands often. I understand that I purchased a "fake" ring but this wasn't at all acceptable to me. The center stone had no fire/sparkle and wouldn't have passed as real, even from far away. 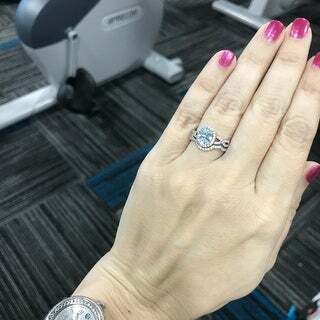 beautiful ring, sparkles nicely and everyone thinks its real!! Very nice. Had many compliments on it so far! I have small fingers and this doesn't look TOO big on it, but it still very sparkly and catches the eye! Wish it came in half sizes as I have to wear a ring guard full time so it doesn't fall off. Love this ring, it looks beautiful on and is very comfortable to wear. I have receydo many compliments. I live the way this ring catches the sunlight. It's simply just shines. This is a pretty little set, but the main stone is off-color and looks terribly fake. No center stone this size if real would ever be held in with only four prongs. The center stone looked pinkish on one end and did not sparkle like other CZ stones. I returned it. The ring looks fake and I will be returning it. Bought this as a gift for a family member and she loved it. Beautiful! I have had several people complement this ring. My solitaire needs to be replaced and this has been a perfect ring to wear as a replacement until I get my ring fixed! really like the ring. cleans very well. Shine and clarity. The quality is outstanding. Received my ring yesterday. It is a beautiful ring and I was looking forward to wearing it this weekend, but, it came broke. The gem was rolling around in the box. I called and of course they can’t replace it and it’s out of stock. Super disappointed. "Does t his ring come with a box?" My set came in a beautiful box. "Can you exchange for a difference size if it doesn't fit ? " "What kind of car is on the Center Stone? Thank you." This is 3.15ct TGW Cubic Zirconia Center Stone. "Is this played in Rhodium or just Sterling Dilver? Has anyone had problems with skin reactions? (Green fingers or irritation) I am very sensitive to nickel..."
It is silver. I bought this for my daughter in law and she has been wearing it almost a year now with no issues. It cleans up well and is still just as pretty as it was when I received it. "Is this ring two separate bands or one thick band?" It is a two band set. "This ring is currently not available in 9, will you be getting more in this size?" We do apologize, we are not aware of a restock date at this time. Please keep checking back with us, we update our inventory daily. "Can this come in a 9.5?" Unfortunately no, this is not available in size 9.5. We apologize for any inconvenience we might have caused.